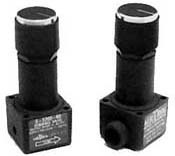 The R-800 series regulators offer high performance in a compact size. 1/8-27 NPT ports allow the use of a wide range of fittings for design flexibility. The R-900 Series regulators are designed for applications requiring miniature size, light weight, and precision. 10-32 ports accommodate a wide range of miniature fittings, including Airtrol Components B-062 and B-125 barbed fittings. 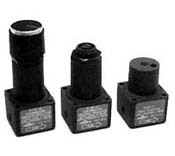 The V-800 Series vacuum regulators are designed for applications requiring high precision in a miniature package. Hysteresis free adjustments are made through a non-rising stem. Available with an attractive knob, or plain, allowing installation of OEM knobs. Also available is a flush adjusting shaft, and factory pre-set tamper-resistant models. Units may be base mounted or panel mounted. 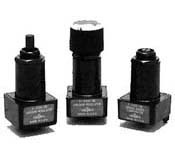 The V-900 Series vacuum regulators are designed for applications requiring high precision in a miniature package. Hysteresis free adjustments are made through a non-rising stem. Available with an attractive knob, or plain, allowing installation of OEM knobs. Also available is a flush adjusting shaft, and factory pre-set tamper-resistant models. Units may be base mounted, panel mounted, or manifold mounted. Airtrol Components F-4103 Series spring biased comparators are essentially a regulator with an adjustable bias (positive or negative), and a control or pilot input. Standard units offer a 1:1 ratio, plus or minus the initial bias. Special 3:1 and 5:1 ratio units are also available. Perfect for HVAC applications, and unique control applications requiring a positive or negative offset. Non-rising stem is available with an attractive knob, plain (allowing installation of OEM knobs) or flush for “back panel” installations. 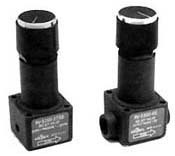 Airtrol 4104 series pressure and vacuum regulators are designed for applications requiring very low output settings and low flow. Full scale ranges as low as 1.5 psi pressure and 3″ Hg vacuum are available. Settings as low as 1″ WC are easily maintained with both. Both units will also accept a pilot input, allowing pneumatic control of the output setting (see schematics). Hysteresis free adjustments are made through a non-rising stem, available with an attractive knob, plain (to allow the installation of OEM knobs) or flush for “back panel” applications. 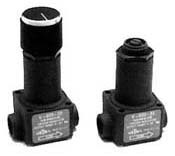 The RV-5200 and RV-5300 Series operate as either a relief valve or low flow back pressure regulators. Adjustments are made through a non-rising stem available with an attractive knob, plain to allow insulation of OEM knobs, or flush for “back panel” applications. A typical application would be the use of a unit between a compressor and a load to prevent the compressor from “loading up” when dead-ended. The S-5200 and S-5300 Series are designed for applications requiring precise sequencing of pneumatic control circuits. Sequencing and deadband characteristics can be tuned by varying the output restriction. Adjustments are made through a non-rising stem, available with an attractive knob, plain to allow the insulation of OEM knobs or flush for “back panel” applications.